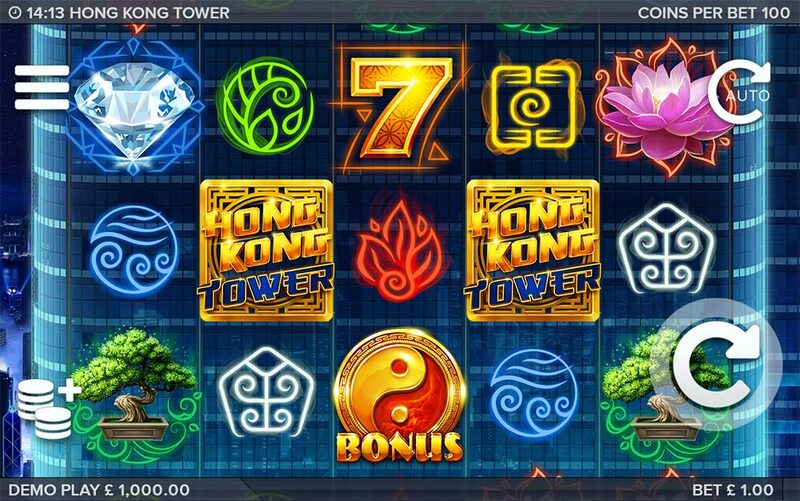 Mr Green Casino has recently added the latest ELK Studios slot to their casino titled Hong Kong Tower, this is an unusual 5×3 reel machine that uses 99 paylines. 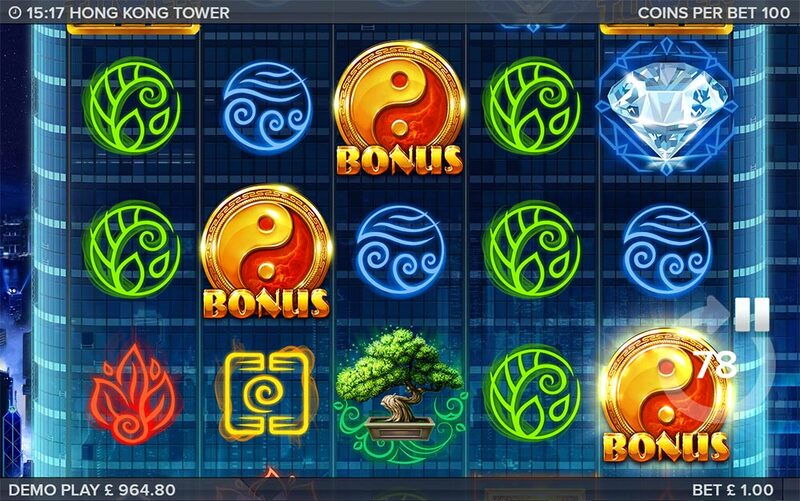 The backdrop of the slot is the Hong Kong Tower with 3 bonus wheels at the top, the reels are contained within the central part of the skyscraper with a mix of high and low paying stacked symbols, bonus scatters, and special symbol substitution symbols that are labeled as “Hong Kong Tower”. There are no wild symbols present on the reels, instead, this slot uses an interesting symbol substitution mechanic. 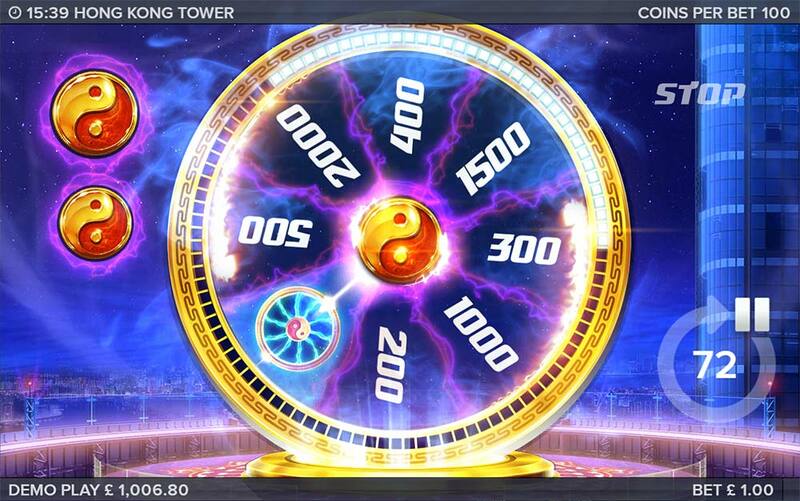 When wins are formed on the reels if any of the special Hong Kong Tower symbols are present and can lead to further wins, they will rotate and turn into one of the main game symbols symbols, the interesting part here is that they can also turn into the special bonus scatter symbols which can really lead to some interesting bonus wheel rounds. 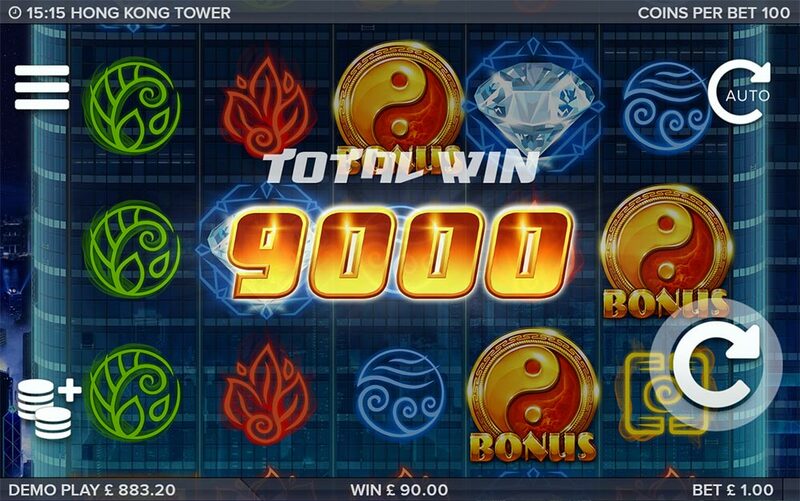 Whilst this slot is hailed as a very high variance game from ELK Studios (9/10 volatility rating), the base game is a little underwhelming, with high paying symbols on the reels there is the chance for a full screen of matching symbols and 99 paylines with a max win of 3016 x bet, but in general the wins tend to be more in the 1x to 30x range in the base game. 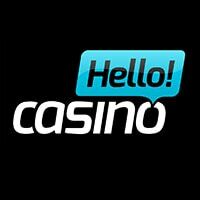 The good news is that the main bonus round feature whilst a very simple feature turns out to be really exciting and potentially very rewarding! 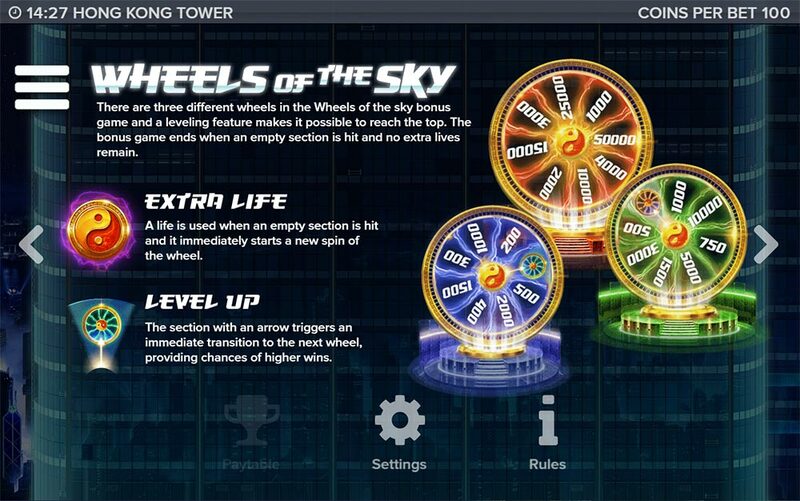 The main bonus round is triggered by landing 3 of more the bonus scatter symbols on the reels which then transports you to the top of the tower where the 3 bonus wheels come into play. The interesting part to the initial trigger is that it can also trigger from the special symbol substitution feature and if more than 3 symbols trigger the round you are also granted extra lives during the bonus wheels round. The bonus wheels all contain a variety of cash rewards, when the wheel stops you are awarded that cash prize and it then becomes greyed out on the wheel, landing on the same reward a second time will end the bonus round unless you have extra lives. 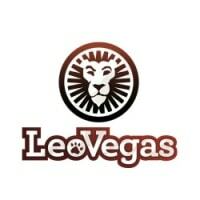 On the first 2 bonus wheels, there is also 1 special wheel symbol, landing on this will transport you to the next bonus wheel which is made up of much higher cash rewards, if you manage to reach the final bonus wheel there are some huge rewards on offer. For such a simple slot mechanic, ELK Studios have managed to make a bonus reel round really exciting, with no feature end until you have at least collected 1 reward, it’s rare to have a truly awful bonus round. We found the Hong Kong Tower slot to be a surprisingly fun release from ELK Studios, whilst the base game is a little lacking in terms of excitement, the simple bonus wheel mechanic has been done really well, and with further high paying bonus wheels on offer there are some seriously big wins to be had from the 2nd and 3rd wheels (100x-500x). 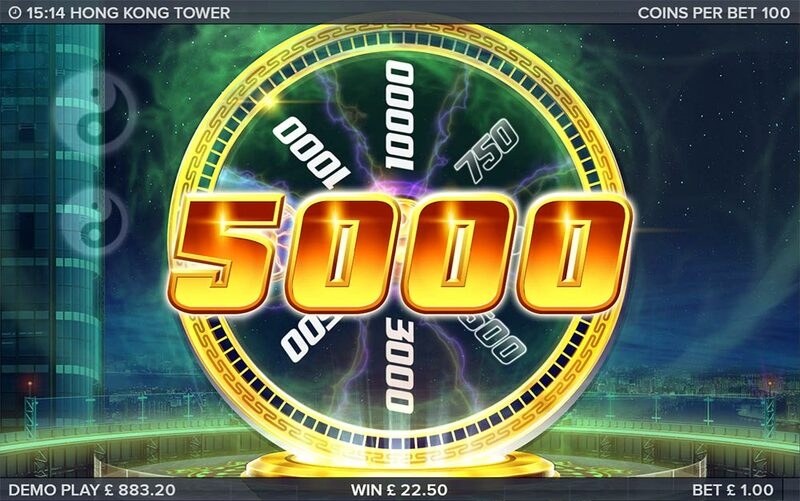 Definitely, a slot to try out and stick with for a few of the wheel bonus rounds, in our playtests we generally ended up in the 30x -50x range on the first bonus wheel, with a few rounds reaching the middle green wheel that resulted in 150x wins. 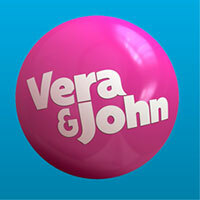 We have yet to make it to the final bonus wheel though were the huge rewards are on offer.